Betty Amongi says the meeting was postponed to end of August. Courtesy photo. KAMPALA—A meeting in the UK where the government had hoped to push its controversial Constitutional (Amendment) Bill on compulsory land acquisition did not flop but was postponed the sector minister said on Wednesday. The postponement was announced amidst talk that the proposed changes in the land law would have met a reception abroad almost as hostile as it has encountered back home in Uganda. 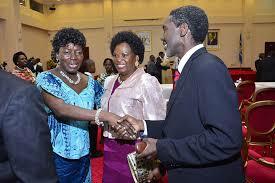 Ms Betty Amongi had been expected in the UK at the weekend but the plans were put off. The Rev Nathan Ntege vicar of St Jude’s Church in Surrey, informed his congregation that a later date will be communicated. 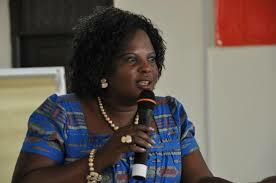 “It will be rescheduled… all my team had already travelled and was on the ground but rescheduled the meeting with them for end of August as we go to UNAA [Uganda North American Association] convention in the US where similar issues will be on the agenda,” she said. The workshop for the ‘Uganda Land Commission Awareness’ should have been held last Sunday at St Jude’s Church hall. A member of the congregation told PML Daily on Monday that President Museveni assigned the minister to talk to them about dual citizenship and the impending change in the country’s land law. “He (Museveni) even called the priest on Friday and told him to ensure Minister Amongi gets audience, but the churchgoers, who are mainly Ugandans, have said they would not listen to the minister speak about a ‘stupid law’,” the member said. This news website could not immediately establish just how widespread opposition to the proposed amendment is in the fairly large Uganda community in the UK. But the proposed amendments to certain clauses of Article 26 of Constitution to provide for compulsory acquisition of private land for government infrastructure projects such as roads has provoked public uproar back home. Many Ugandans fear that such a law will allow the government grab their land at will. If enacted into law, the draft proposal will make it possible the government to take over private land without prior compensation. Under current constitutional provisions fair and adequate compensation must be paid to a land/property owner before any takeover. Civil society actors, MPs, the political opposition and the general public want this provision maintained because the government is not known to pay promptly. Domestic arrears and unpaid court awards already run in billions of shillings, calling into question the promise to pay property owners after dispute resolution in court. There are also strong disagreements about valuation. This Tuesday deputy attorney general Mwesigwa Rukutana and Ms Amongi had a torrid time in the House Legal and Parliamentary Affairs committee when they came to defend the proposal. Owing to such nationwide condemnation of the proposed law which is already being denounced as unconstitutional, it is easy to see why Ugandan community in the UK is jittery about listening to the minister speak about land-related issues. But Minister Amongi refuted the view that the congregation had forced the cancellation of her meeting, instead telling PML Daily that she couldn’t travel due to an emergency land problem in Kapeeka sub-county Nakaseke District which she had to attend to. Parliament Speaker Rebecca Kadaga (left) greets Lira Municipality MP Jimmy Akena as Land minister Betty Amongi looks on. Courtesy photo. She also said the meeting in the UK did directly have anything to do with the land law. “This meeting about helping Ugandans in the Diaspora process [land] titles; check the status of their property or titles through our computerised land information system; educate them on how to purchase property from real estate developers who are registered with us to avoid being conned, etc,” Ms Amongi said. She said the UK meeting is not the first such programme Uganda’s government was carrying out involving the Diaspora community. “We did a successful one in March in Washington DC and that’s how UNAA wrote asking that we present at their convention,” she said. The government has lately come under intense public scrutiny as it tries to push through with the controversial amendments. Some opinion leader have gone as far as to warn of a massive land grab by regime insiders under the cover of a new legal dispensation. Earlier this month, Amongi said the proposed amendments were premised on the delays in agreeing compensation of project-affected persons, which tend to stall public projects. She said the new law would shorten the processes involved in land acquisition from private individuals by allowing government to start the projects pending negotiations on compensations with the affected persons.